Born: Prato, Italy, 26 February 1952. Education: Studied stage design, Accademia delle Belle Arti, Florence, 1971-74. Career: Freelance designer for Touché, Gentry, Tycos, Aquarius, Lux Sports, and Ilaria Knitwear, Milan, 1972-79; formed Enrico Coveri, SpA, 1978; formed Enrico Coveri France S.A.R.L., 1983; opened boutique in Milan, 1981, with subsequent shops in Genoa, Viareggio, Piacenza, Paris, Saint Tropez, Beirut, and New York; launched perfumes Paillettes, 1982, and Dollars, 1983; introduced home furnishing line, 1984. Exhibitions: Consequenze impreviste, Prato, 1982; Italian Re-Evolution, La Jolla Museum of Art, California, 1982. Awards: Uomo Europeo award, Rome, 1982; Fil d'Or award, Munich, 1982. Died: 6 December 1990, in Florence, Italy. Sartogo, Piero, ed., Italian Re-Evolution: Design in Italian Society in the 1980s (exhibition catalogue), La Jolla, California, 1982. The Power of Paris, video, New York, 1991. Baldacci, Luisa, "Enrico Coveri: lo stilista del colore," in Arbiter (Milan), No. 2, 1982. "Enrico Coveri illustra il segreto della sua moda," in La Nazione (Milan), 14 June 1983. "Enrico Coveri: graffiti che corrono e ballano," in Vogue (Milan),January 1985. "Parigi: spot su Enrico Coveri. Enorme o incollato, la moda degli opposti," in Vogue (Milan), February 1985. "Enrico Coveri: nuovi schemi per il classico," in L'Uomo Vogue (Milan), July/August 1985. 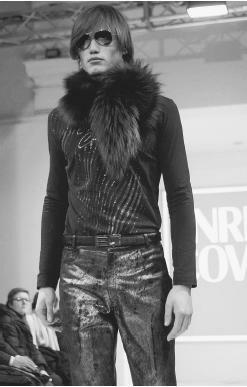 Enrico Coveri, fall/winter 2001 collection: sequined sweater with a fur collar and gold-tone pants. Morera, Daniela, and Joe Dolce, "Enrico Coveri," in Interview (NewYork), February 1986. "Enrico Coveri: uno stile all 'inglese," in Donna (Milan), July/August 1987. "Enrico Coveri: righe, quadri, forme base…," in Vogue (Milan),January 1988. Obituary, "Enrico Coveri Dies in Italy of Stroke," in Women's Wear Daily, 10 December 1990. Obituary, "Enrico Coveri, Italian Fashion Designer," in Chicago Tribune, 10 December 1990. "You Young" is the name of one of the several seasonal Enrico Coveri collections. It is also perhaps the most succinct description for his bold, unpretentious, and fun-loving fashion: strong, vibrant colors and striking, witty designs that have always been clear and intelligible, with zany prints and knits often incorporating Pop Art designs and cartoon characters. 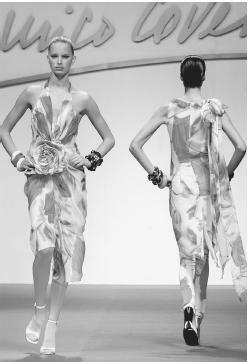 Enrico Coveri, spring/summer 2001 collection. Enrico Coveri was born in Prato, near Florence, Italy and studied at the Accademie delle Belle Arti in the city. He began his career as a freelance designer, creating knitwear and sportswear lines for three collections, Touché, Gentry, and Tycos, making his mark by being one of the first designers to use soft pastel shades. After a brief move to Paris in 1978 to work for Espace Cardin, he returned to Italy and established his own namesake company. Each season the company produced a ready-to-wear women's line and several less expensive boutique collections for men, women, teenagers, and children, as well as a vast array of subsidiary Coveri accessory products such as shoes, bags, hats, scarves, and gloves. Although he excelled at casual clothing, even his eveningwear exuded a young, sporty, wearable feel. Coveri enjoyed shocking and going out on a limb with design. "I love the unexpected to the point of traveling everywhere without set itineraries," he declared when, after three seasons pursuing his ultra casual look, he suddenly produced a collection of extremely feminine tight skirts and high heels. "That certainly shattered the common belief of Coveri only doing things for 16-year-olds," he recalled. Asked for his design inspiration, he replied that he never really gave it any serious intellectual thought, preferring spontaneous incidents to spark ideas and feelings. His ideal woman, he declared, was as indistinct and volatile as he, living for the present and spurning retrospectives or fashion revivals. He studied the contemporary woman in the street, her attitude, her clothes, movements, and accessories. Perhaps Coveri's strongest and most recurrent theme was in his use of paillettes or sequins. Each collection produced a new garment in the fabric, a bright red skin-tight all-in-one, for instance, or a full-length evening dress, or it promoted a new development in the fabric, such as stretch sequin or mixtures of matte and shine. Other favorite fabrics included Lycra and stretch satin, superfine linen, silk, and cotton poplin. The young, sporty Coveri woman's silhouette seemed to always fluctuate between cling or fluidity, with a recurrent ethnic theme interpreted in a fresh and contemporary way. This led journalist Hebe Dorsey to dub Coveri the "Italian Kenzo" in the Herald Tribune. In a 1978 interview Coveri declared a disdain for the usual work methods of a fashion designer, adding that he hated to draw or do fittings. His approach was very immediate: ideas would come in torrents during long, sleepless nights and were sketched out rapidly the next day. Models were also dressed and styled at the last minute, the outcome on the catwalk being directed by his mood at the time. "I probably make and will continue to make dreadful mistakes," he explained. His mistakes, however, were obviously not serious enough to prevent his establishment as one of Italy's most famous and successful fashion names. Although Enrico Coveri died of a stroke in 1990, at the age of 38, the business was continued by his family. Under the direction of his sister and a chosen design team, successive collections continued to evoke Coveri's acknowledged fashion legacy.